Bella Mama was established in 2005 by a group of Mums who wanted to come together and share their love of music and enjoyment of singing. Ten years on, Bella Mama’s members are women of all ages (and not all Mums) who have different levels of musicianship but simply share a love of singing. Creating beautiful harmonies remains the focus of our weekly rehearsals. Bella Mama enjoys singing a wide variety of repertoire from many different genres, both accompanied and a capella. James Hunt has been playing music for over 25 years. He completed the Jazz Degree at WAAPA before going on to do a Diploma Of Education. 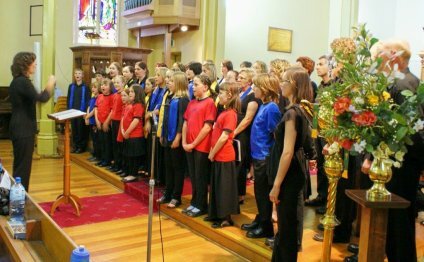 James furthered his choral knowledge studying a Kodaly Summer course in Brisbane in 2012 and takes various choirs around Geelong. He thoroughly enjoys his work with the Bella Mama Choir and is passionate about exposing them to a wide variety of repertoire from various genres including jazz, pop, reggae and a capella. They learn to improvise, add embellishments and create voice percussion parts to these various styles.